Monday Men Style: A Monk-Strap A Day. Like the gals, the fellas have their trends for each season, and trying to be focused on noticing the fashion trends is hard work for me, when you guys wear the clothes so bloody well! It’s like a hot dish at a restaurant that gets all the guests worked up, and coming back for more! We all want to know what the main ingredients are involving when making the hot dish of the season. Hate to compare you guys as a meal, but chops are being licked after a walk-on-by moment. So the ultimate look of the season is the hot dish and the ingredients are the trends. 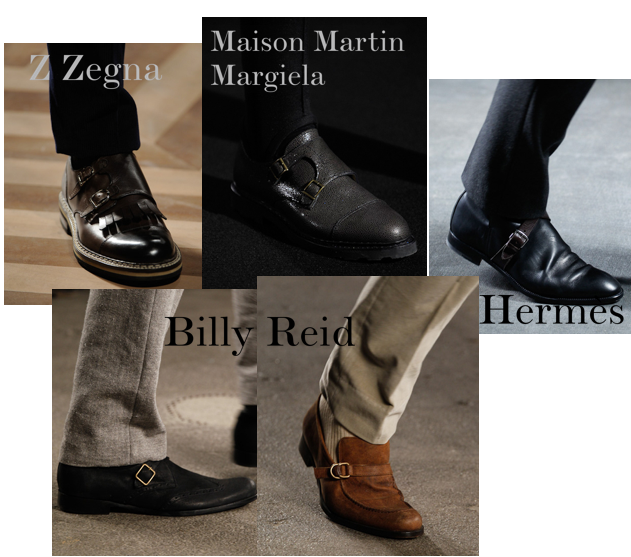 One trend I’ve noticed are monk-strap shoes being worn not just by suit-clad men, but also paired casually with jeans or shorts with high socks. No More Playing Dressed Up: Resort 2013 Collections.